as always, i'm gonna be straight with you. at one point in the beginning of July, it was looking like this would be a long, sad month for Michael. in fact, i was mentally preparing myself for this to be his worst month of the season yet. luckily, it didn't come to that. if we split the month in two, Michael bat .244 (11-for-45) in 12 games from July 1-12. so you can see what sparked my initial concerns. i was openly worried about how Michael's month of July would go as a whole based on how little he hit in the first half of it. but after the All Star break, he bat .346 (18-for-52) from July 17-31 in the final 14 games and seemed to be "back" to normal lol i think it's fair to say that the break saved Michael's July. Michael had a small 8-game hitting streak that started on June 24 and went to July 2. it wasn't a long streak within this month and that's why his first half wasn't better than it was. he had a few multi-hit games in the second half, which really helped bump up his overall July #s and he ended up earning himself a July batting average of .299. unfortunately, that wasn't enough to improve his overall BA. that stayed at exactly .300--right where it was at the end of June. in early July, interleague play combined with Michael's back strain equaled disaster. Michael's 8-game hitting streak came to an end in the game against the Pittsburgh Pirates on July 3 after his 0-for-3 performance. his 8-game hitting streak on the road was also snapped at that time. even so, Michael did manage to get on base twice with 2 walks to keep his on-base streak going. not to make excuses, but this was just not a good night for a game. the weather conditions were poor and the hard rain the guys had to play through couldn't have made it very easy on the hitters. with better circumstances, his hitting streak might have lived on, at least for one more day. the next day on July 4, Michael had another hitless game, going 0-for-4 against the Pirates. this time he didn't reach base at all, therefore ending his 9-game on-base streak as well as his 9-game on-base streak on the road. he managed 1 hit on July 5, but his overall 1-for-11 showing in Pittsburgh was substandard. when the Indians returned home to play the Houston Astros on July 6, Michael went 0-for-3 with a walk, bringing his season batting average down to .286. in addition, that gave him 3 0-fer games in his last 4. thankfully, Michael did better in the final 3 games of the series, finishing it 6-for-14. the last series before the All Star break was at home versus the Oakland Athletics. i'd hoped that Michael could close out the first half strong, but instead he went a paltry 2-for-11. it seemed to me as though he needed the break more than ever right then. coming out of the break, the Indians immediately got into some more interleague play--not necessarily the best thing for Michael's game. but Michael was 4-for-11 against the Cincinnati Reds with 2 doubles, 1 home run, 5 RBI, and 4 walks. then in another short interleague series, Michael went 5-for-8 against the Milwaukee Brewers with a double, home run, 4 RBI, 2 runs, and 1 walk in 2 games. by the time interleague was over, Michael's batting average had gotten back up over .300 (to .302). in total, his 9-for-19 triumph convinced me that the 4 days rest he got was very good for him because that was a highly successful post-break interleague road trip. in the next series featuring another AL Central foe, Michael excelled. when the Kansas City Royals came to town, he put up a 4-for-10 showing. in one game, he hit a home run after being hit by a pitch and i was like, you go, boy! that's the best revenge. finally, the Indians traveled to the West Coast to play the Athletics to end the month. knowing that Michael did not perform well against them earlier in July, i had some reservations. in the last 2 games of July, Michael was only 2-for-8. that isn't exactly finishing the month with a hot stick, but i'm pleased he was able to get one hit in each game and keep his road hit streak alive (presently at 8). Michael caught a break, literally, in that the All Star break was this month. that may have helped with his recent performance and had a direct result on some of his July stats. his 29 hits, 4 homers, 18 RBI, 14 walks, and 48 total bases in 26 games was a definite improvement from June. dare i even say he seemed more like himself (well, the guy from 2014) over the past couple weeks. but there are no more big breaks ahead for Michael to take advantage of. so how he's going to wrap up these remaining 2 months of the season is anyone's guess. i worry that sometime soon, the back strain will hinder his abilities again. but for now, let's just enjoy his month of July. i'm under the impression that Michael is simply "stuck" when it comes to certain categories this year involving 2 outs. Michael continues to struggle when he comes to bat with RISP and 2 outs in an inning. i can't figure it out because he does well when there are no outs or 1 out. it's peculiar. but he's 0-for-4 since July 10.
his numbers with 2 outs in an inning are not desirable either. between his last at bat on July 10 through July 23, Michael was 0-for-7 with a walk, before finally hitting a 2-out double in his first at bat on July 24. overall, he was still mostly an inning-ender, and i hated seeing that from Michael. one area that was uncharacteristically mediocre for Michael was his performance against left-handed pitching. this was a trend that actually started last month, and regrettably he didn't do much better in July. he usually doesn't have any issues against lefties, but he had a rough patch between July 2-9 where he went 0-for-9 in 11 plate appearances, and is currently 0-for-9 since his second AB on July 25.
lastly, Michael's lack of stolen bases in July somewhat bothered me. in the first half of the month, i suppose that made sense. but after the break, when it appeared as though Michael was well-rested and playing better, i was a bit flabbergasted that he didn't try stealing more. maybe that merely stems from the tough teams the Indians faced, but still, it took until July 28 for him to steal 2 bases in the same inning of the same game (the only 2 bases he stole all month, btw). the top 3 hitters seem to be set in stone now. in contrast, everything after that has become a juggling act for Terry Francona, and that's partly in thanks to Carlos Santana, who's been disappointing to say the least. on July 7, Tito moved Santana down to the 7th spot in the order and bumped Yan Gomes up to 5th. his argument was that Gomes was beginning to hit better, while Santana was struggling. the team was facing a right-handed pitcher that night. however, on July 8, Santana was batting 5th again and Gomes was 6th, against another righty. facepalm. but wait, there's more. right before the All Star break, it looked like Santana had found his swing again, or at least discovered something that was working and getting him on base more. so on July 19, the 3rd game after the break, Santana was back batting cleanup against RHP Johnny Cueto of the Cincinnati Reds. and of course, he went 0-for-5, stranding 8 runners. the next game was on July 21 and Santana was still batting 4th, with Brandon Moss 5th and Gomes 6th (with a righty on the mound). on July 22, David Murphy was in his regular spot batting cleanup, and Santana was moved down to 5th again (against another righty). granted, some of these changes might have been a result of interleague play because when the Indians got out of National League parks and came home on July 23, we got back to the old lineup of Murphy 4th, Santana 5th, and Gomes 6th. the Indians faced 3 lefty starters from July 24-26. and so we had the usual: Raburn batting cleanup while Santana hit 5th and Gomes 6th (when he played). Murphy/Raburn batting 4th in the order and Santana 5th was probably the planned order going forward again, except Murphy was scratched from the lineup on July 28 after being traded to the Los Angeles Angels. Santana and Moss were then moved up in the order, batting 4th and 5th respectively (against a righty starter). they held those spots in the order on July 29, too. still with me? good cause i'm not done. on July 30, Moss was traded to the St. Louis Cardinals, and Gomes was then inserted into the 5th spot. omg that was an exhausting amount of lineup manipulation. but i think now Santana is going to finish the year batting in the cleanup spot, and when Gomes plays, he will be 5th. so how did all of this BOP maneuvering affect Michael? hardly at all because he only scored a total of 12 runs in July--after getting himself on base 44 times--and 4 of those came from the home runs he hit himself. at the end of the day, i just want some good hitters batting after Michael who will be able to bring him home whenever he gets on base in this last half of the season. as for the 1 and 2 batters, they continued to get on base quite a bit. Jason Kipnis maintained his hot hitting and Francisco Lindor improved at the plate. so those RBI opportunities were certainly there for Michael. and he looked better in the 2nd half of the month than the 1st, just as long as he wasn't batting with 2 outs in an inning. right away this month, i was worried about Michael's back strain. the first 2 games of July were the last 2 games of the Tribe's series against the Tampa Bay Rays, where they were playing on AstroTurf in Tropicana Field. i figured Michael would DH at least one game in the 4-game series, and possibly even get one game off. to my surprise and dismay, he played the field in every game--left field in the first 3 and center in the 4th game (which went 10 innings). Michael was the DH in the game on July 7 versus the Houston Astros. this wasn't explicitly stated as a "half-rest" day for Michael, but it could have been. and you can't argue with the results: he had a great night tallying 3 hits, one being a home run--his first since May 14.
following the game, it was made known that Michael gets treatment on his back before every game. not only that, but he finally acknowledged the elephant in the room. "it's just very important to make sure i stay on top of it," Michael admitted. "it's the little things. the great medical staff we have has a great plan each and every day when i come to the field. we sit down and talk about it, and then we execute it. we're doing a great job with it." he continued, "we have a great medical staff that stays on me and i stay on myself to make sure i'm out there each and every day. i love playing baseball and being out there with my teammates. i don't want to miss any more games. the more i'm out there, the happier i am." i understand and appreciate that quality about him, but if he's hurt and getting time off is the best thing for him, then he has to accept that and do what's best. period. in a Hey, Hoynsie article posted on July 11, someone asked if Michael was still having back trouble because it didn't seem as though he was running as well as last year. Paul Hoynes replied with, "couldn't agree more. you can tell on the bases and in the outfield. i give him credit for not only staying in the lineup, but producing at a high level. the All-Star break is coming at a good time for Brantley. i just hope playing with this injury doesn't hinder him in the years to come. i doubt that he'd be out there if the Indians' medical staff felt he was at risk." Hoynsie mentioned something that i had mulled over a while ago but then blocked out of my mind, and that's about how his back may affect his future. i'm not worried about him playing through the injury; my fear is that this strain could linger and "strain" the rest of his career... let's hope not. i went to the game on July 11 versus the Oakland Athletics, and much like the last time i was in Cleveland, i again saw Michael hunched over in left field on several occasions. i don't ever recall him doing it so much in a season. and i never notice any other player in this position during breaks in action. it's gotta be back-related. because Michael was not selected to this year's All Star game, it gave him 4 straight days off to do whatever he pleased. while i do not have those details, i knew that all that time off would be beneficial for his back. when Michael went 2-for-3 with 2 doubles in the first game after the break on July 17, and then hit a (3-run) home run on July 18, that assumption turned out to be true. Terry Francona figured as much as well. "that's the idea. you could see it last night. his bat looked like it had some life to it. that was good to see." while no one will outright say that the back strain is to blame for Michael's lack of power this season, Francona expressed to the media before the July 18 game against the Cincinnati Reds that Michael will not make excuses either way. "i don't want [to talk about his back], because i don't think he wants to get into it. but he goes out there every day regardless of how he's feeling, and he finds a way to compete. whatever percent he's at, he gives you every bit of that. if his slugging is down, i get it, but i also see what he does, and i know when there's a runner in scoring position, we like when he's up." Tito proclaims having that kind of leader in his lineup is "immeasurable. it makes your job a lot more fun, a lot more rewarding." Michael may at long last have publicly declared that his back is something that continues to need attention, but he still won't get into the specifics of it. even in a postgame radio interview with Tom Hamilton on July 18, Michael sort of evaded the issue. Hammy first asked Michael about the hot weather in Cincinnati, and he stated how "it makes you feel loose as soon as you get on the dugout steps and everything in your body just flows." then Hammy asked if his back felt better after getting 4 days off. Michael restrained himself with this reply: "yeah, any time you get some rest, enjoy time with the family, and get your mind right for the second half, it always helps." that's typical Michael, but he didn't answer the question the way fans would have liked him to. during Michael's 4th at bat on July 22 in the game against the Milwaukee Brewers (before he hit a double), Hamilton mentioned on the radio that Michael looked like the Michael Brantley of a year ago. then Hammy said, "but don't ask him about his back, or he'll give you the death stare." Hammy continued on, saying Michael is old school and just wants to play. but then he confused me when he added, "even his manager doesn't ask him about his back." was he talking about Tito? or did he mean to say his agent doesn't ask him about it? idk, i just thought that was a weird way to phrase it if he was referring to Francona. why not just say Francona? after Michael's 4-hit game on July 22, the media couldn't help but infer that the 4-day All Star break had done some good for Michael's back. "it sure looks like it," Francona confirmed. Michael was more broad about the break, claiming the time off was good for mental rest, too. "any time that you get a four-day break, you get to spend some time with your family and just kind of get away and relax your mind from the daily grind of baseball, it's going to help." additionally, in Dennis Manoloff's game report, he noted that "as one way to mitigate jolts, Brantley appeared to be wearing shoes with more padding in the soles Wednesday." if that's gonna help his back, then i hope he wears those every day until the season is over. as has become custom, when i went to the Indians game on July 25, i saw Michael hunching over several times, just like i did in the game i was at 2 weeks prior. (except he was playing in center field this game as opposed to left field on July 11.) i guess that's just something he's gonna be doing during innings when he's in the outfield for the duration of the year. maybe the medical staff encourages it in between pitches. maybe that helps his back, who knows. but it is quite noticeable, at least to me, so i felt i should document that again. 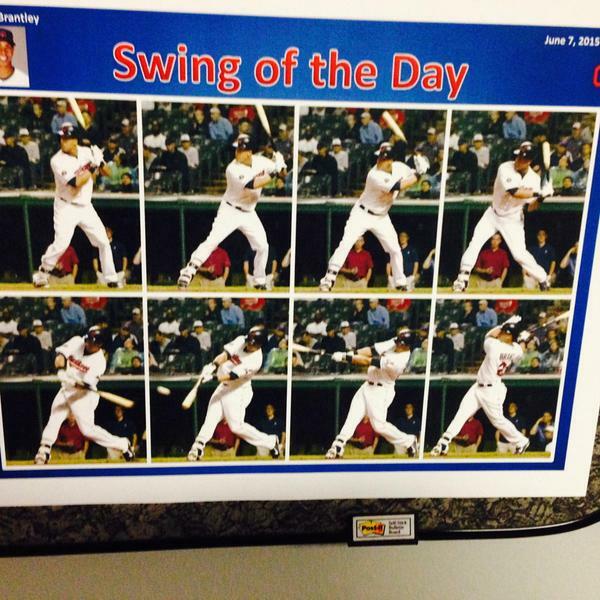 Francona put Michael in the July 29 noon game lineup as the designated hitter. because the break was just less than 2 weeks ago, it probably wasn't done so much as to give Michael some rest, but as a way to put freshly called up Tyler Holt in the lineup. Tito might have wanted Holt in the outfield for his first game back with the Tribe rather than be a DH. and since Michael did play a full game in left field the night before, it may have been easier to use Michael as the DH in the day game. in closing, the AS break was the lone reason why Michael's back wasn't an issue for all of July. i'll be stunned if his back strain doesn't act up again in August and September/October, because other than an off day here and there, he's not going to get a significant period of consecutive days off. not unless he's really hurting and the doctors feel he absolutely needs it, that is. in regards to overall batting average, Michael still has some catching up to do. unless Kipnis goes through a major slump and Michael goes on a long multi-hit streak in the last 2 months, neither of which i see happening by the way, Kip is going to own the highest batting average at the end of the season for the first time in his career, and Michael's 3-year reign will end. Michael hit his first home run since May 14 on July 7. then he hit 3 more home runs after the All Star break. his power seems to come and go, depending on how much his back is affecting him and/or the amount of rest he gets. it's almost as inconsistent as his offense has been this year. but given that he had a nice 4 day break this month, it's no surprise he was able to hit a few bombs. these career high 4 home runs are a definite improvement from June, when he didn't go yard at all. Michael increased his RBI total by a large margin. he only had 8 in all of June, whereas he already had 8 for July at the break. for the whole month, he finished with 18 RBI, also a career high for July. as for missed opportunities, Michael left 32 guys on base. amazingly, that number is a welcome decrease compared with his past 2 months, so he's making progress there. i can calculate a HR:RBI ratio this month since Michael's home run power re-emerged. 2 of Michael's 4 homers were solos and the other 2 were 3-run bombs. therefore, 2 of his 18 RBI for July (11.1%) came from his solo homers, while 8 of his 18 RBI (44.4%) came from all 4 of his home runs. Michael once again had a very low strikeout rate for the month. his K rate in July was 8.2% (8 K/97 PA). that's outstanding. in July, Michael had 36 groundouts versus 27 flyouts. he had a few less total flyouts simply due to the fact that 4 of his hits actually flew OUT of the ballpark lol he also had 12 lineouts for the month. Michael had a hit in 20 of the 26 games he played in July and reached base safely in 23 games. he had 6 hitless games, but reached base in 3 of those. Michael had 6 multi-hit games, 2 3+ hit games, and 5 multi-RBI games. he had at least 1 RBI in 10 games. in addition, he had 3 go-ahead hits and 3 go-ahead RBI this month. the Indians were 13-13 in games that Michael played in. Michael had a modest 8-game hitting streak, over 9 days from June 24 - July 2, batting .353 (12-for-34) with 3 multi-hit games. he had 12 hits, 2 for extra bases, and 14 total bases. his stats during this streak included 10 singles, 2 doubles, 5 RBI, 1 sac fly, 3 runs, 2 walks, 1 intentional walk, 1 stolen base (2nd), 1 GIDP, 3 strikeouts swinging, 1 first at bat hit, and 11 men left on base in 37 plate appearances and 34 at bats. he had a .378 OBP, .412 SLG, and .790 OPS. in the field, Michael played both left and center--5 games in left: 44 innings, and 2 games in center: 18 innings. he recorded 11 putouts and committed 1 error, giving him a .917 fielding percentage. he was the DH in 1 game as well. Michael also had an 8-game hitting streak on the road from June 16 - July 2.
he ended the month with an active 8-game hitting streak on the road from July 5-31.
additionally, he had a 9-game on-base streak from June 24 - July 3, along with a 9-game on-base streak on the road from June 16 - July 3. Michael also had an 8-game on-base streak from July 17-25.
plus, he's currently taking an 8-game on-base streak on the road (from July 5-31) into August. in July, Michael bat .318 (21-for-66) against right-handed pitchers and .258 (8-for-31) against left-handed pitchers. he continues to now be a more reliable hitter against righties as opposed to lefties. and he's still doing abundantly better against one side over the other. his ability to hit righties and southpaws relatively equally is missing at the moment. Michael hit .300 (15-for-50) with 5 RBI at home and .298 (14-for-47) with 13 RBI on the road in July. he hit safely in 10 of the 14 home games he played and safely got on base in 12 of them. he was hitless in 4 home games but still reached base in 2 games. he also hit safely in 10 of 12 road games and got on base in 11 games as well. he was hitless in 2 road games, still reaching in 1. Michael bat .364 (8-for-22) with runners in scoring position, manufacturing 16 RBI this month. more specifically, he bat .500 (3-for-6) with RISP and 0 outs, .500 (3-for-6) with RISP and 1 out, and .200 (2-for-10) with RISP and 2 outs. his struggle is incredibly real when there are 2 outs and RISP. as for his performance with 2 outs in an inning in July, Michael hit .231 (9-for-39). i'm really starting to yearn for the days when he was a great 2-out hitter. in addition, Michael bat .368 (14-for-38) with 16 RBI with runners on base and .500 (1-for-2) with 4 RBI with bases loaded in July. he had more at bats this month with no one on base and did not do as well, batting .254 (15-for-59) with bases empty, with 5 doubles, 2 home runs, 2 RBI, and 8 walks. vs. the Chicago White Sox, Michael bat .200 (3-for-15) in 4 games in July. he had 2 doubles, 1 walk, 2 first at bat hits, and 5 total bases. he grounded into 1 double play, had 3 strikeouts (2 swinging, 1 looking), and left 7 men on base. in 36 innings in the field--9 in left and 27 in center--Michael recorded just 3 putouts. the Indians did not face the Detroit Tigers or Minnesota Twins this month. this was a much better month stats-wise for Michael and it remained so when compared with the rest of the Tribe. in July, Michael led the team with 11 extra base hits (tied), 7 doubles (tied), 4 home runs (tied), 18 RBI, 48 total bases, 26 games (tied), .389 OBP, .495 SLG, and .884 OPS. he also had the least amount of strikeouts among the regular starters with 8.
he was 2nd on the team with 29 hits, 12 runs (tied), 14 walks, 113 plate appearances, and .299 batting average. he was also 3rd with 18 singles, 1 sac fly, 2 stolen bases, and 97 at bats. after looking through my Michael documentation, i found that Michael normally has very strong Julys. i think that originates from the All Star break, when he can get some extra days rest and really recharge himself. but because he had a back strain this year that undoubtedly hurt him in the first half of the month, this July wasn't as great as the others in his career. therefore, he only set career highs for himself in July with 4 home runs, 18 RBI, and 14 walks. he also had a career low 2 GIDP. next i compared Michael's July numbers around the league, and he ranked in the top 10 in many categories. among qualifying players in the American League, Michael ranked tied for 7th in walks (14). he also ranked tied for the 2nd least amount of strikeouts (8) out of 97 players. among qualifying outfielders in the American League, his walks ranked 2nd; his games played (26) ranked tied for 3rd; his plate appearances (113) ranked 5th; his doubles (7) and RBI (18) ranked tied for 6th; his sac flies (1) and at bats (97) ranked tied for 8th; his OBP (.389) ranked 9th; his hits (29) and hit by pitches (1) ranked tied for 9th; and his extra base hits (11) and home runs (4) ranked tied for 10th. his strikeouts also ranked 34th out of 34 players. among qualifying left fielders in the American League, Michael was tied for 1st in games played; 2nd in walks and plate appearances; tied for 2nd in stolen bases (2); 3rd in hits (29), doubles, RBI, at bats, and OBP; tied for 3rd in home runs and hit by pitches; 4th in extra base hits, total bases (48), batting average (.299), and OPS (.884); tied for 4th in sac flies; 5th in SLG (.495); and tied for 6th in runs (12). he was also 11th out of 11 players in strikeouts. among all major league left fielders, Michael ranked tied for 1st in games played; 2nd in walks and plate appearances; 3rd in doubles, RBI, and at bats; tied for 4th in hits and home runs; tied for 5th in sac flies; 6th in extra base hits and total bases; 7th in OPS; tied for 7th in runs and hit by pitches; 8th in batting average and OBP; 9th in SLG; and tied for 10th in stolen bases. in addition, he ranked 22nd out of 22 players in strikeouts. among all major league outfielders, Michael was tied for 4th in games played, tied for 5th in walks and plate appearances, and tied for 9th in doubles and RBI. he was 68th out of 68 players in strikeouts, too. Michael got his first multi-RBI game of the month on July 2 with an RBI sac fly in the top of the 4th inning, and 2-out RBI single in the top of the 5th inning against Tampa Bay Rays lefty, Matt Moore. this was his first multi-RBI game since May 20! moreover, his RBI single in the top of the 5th was his first hit with RISP and 2 outs since June 5.
now let's get into the first BS strike 3 call on Michael this month. in his first at bat on July 5, with 2 outs in the top of the 1st inning against the Pirates, Michael quickly had 2 called strikes on him while facing Gerrit Cole. he fouled the next pitch off and then Cole threw Michael 2 balls. Michael fouled off the 6th pitch and then home plate umpire Angel Hernandez called pitch #7 as strike 3. Hernandez had already been (mis)calling balls as strikes a lot in just this 1st inning of the game with his seemingly very wide strike zone. but that 7th pitch to Michael was definitely a ball outside. consequently, another K was erroneously added to Michael's stats. i tell ya, if some of these crap backwards Ks were taken away from Michael, he'd probably be the toughest hitter to strike out in all of baseball. after this game, the final All Star voting results were revealed. Michael had dropped to 9th place and was almost 7 million votes behind the 3rd starter, Kansas City Royal Alex Gordon. however, Gordon suffered a groin strain on July 8 and was not going to be able to participate in the All Star game. it wasn't long before New York Yankee Brett Gardner was named as his replacement. refer to my Brantley Not Selected For MLB's 2015 All Star Game blog for more details. in the July 6 game versus the Houston Astros, Michael went 0-for-3 with a walk and his overall batting average dropped down to .286. he was so upset with himself and his performance that he stayed long after the game ended and worked on his swing in the indoor batting cage. i learned of this information during Michael's first at bat in the following game versus the 'Stros when Tom Hamilton announced it on the radio. i was happy to hear that not only was Michael frustrated with himself (like i was), but he took action to try and rectify the situation. his troubles may have been the reason why Terry Francona allocated him the designated hitter role for this July 7 game. anyways, right after Hammy divulged this story, Michael hit a 2-out single to right field after a 1-2 count off Vincent Velasquez in the bottom of the 1st inning. so it appeared as though the extra bp paid off right away. that was his first of 3 hits in the game. his 3rd hit of the game came against ex-Indians pitcher, Roberto Hernandez, formerly known as Fausto Carmona. in the bottom of the 8th inning, Michael again swung at the first pitch and hit a 1-out line drive single to left-center field. according to Statcast data, Michael's swings were hard. the home run he hit came off his bat at 107 mph, which tied the hardest-hit ball he's had so far this season. in addition, his first single of the game registered at 98 mph and his third single was hit at 104 mph. maybe some of that power materialized as a result of his infuriation with the previous game. needless to say, Michael was in high demand for postgame interviews. the first one he did was with Andre Knott on the field before heading to the locker room. he spoke of the importance of giving Corey Kluber some run support early, cleverly sidestepped the mention of his back injury "earlier in the year," and confirmed the plans of finishing strong as a team before the All Star break and playing like they did last year in the 2nd half. afterward when Michael met with the media in front of his locker and was asked about his home run, he simply declared, "it felt good. it was a big swing at the time of the game. to go up 2-0 instead of 1-0; and one swing away, now they're two swings away." the historical significance of his bomb meant little to him. aside from this homer being his first since mid-May, it closed the books on a time period of 46 games and 206 plate appearances without hitting a home run. that is officially the longest Michael's ever gone without a homer within a season in his career. 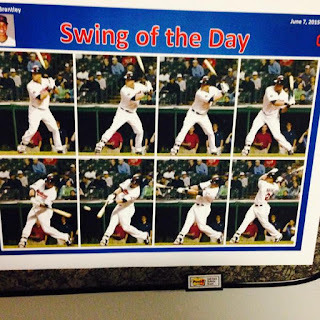 in the afternoon on July 8, Paul Hoynes announced on twitter that Michael's home run made the Indians "swing of the day." this is something the Indians have been doing all season, but it was the first time i ever heard that one of Michael's swings received the prestigious honor. with the way he'd been playing, it's very possible that this was his first SOTD of 2015.
in the game on July 10 versus the Oakland Athletics, home plate umpire Laz Diaz ticked off Michael and myself with his bogus strike 3 call. yep, here we go again. it was Michael's first at bat in the bottom of the 1st inning against Kendall Graveman with 1 out and Francisco Lindor at 2nd base. Michael got the count to 2-2 before Diaz called a pitch outside as a strike. Michael was not happy and looked at him as he went back to the dugout. later in the [July 10] game, Michael came to bat with 2 outs and the bases loaded--Michael Bourn at 3rd, Jason Kipnis at 2nd, and Lindor at 1st base--in the bottom of the 6th inning. by this time, former Indians farmhand Drew Pomeranz was pitching for the A's. Michael swung at Pomeranz's first offering and hit a line drive single to center field, scoring Bourn and Kipnis. this marked Michael's first hit with the bases loaded since April 24! and it was just his 2nd hit overall, as he was still only batting .222 (2-for-9). admittedly, any situation in which Michael comes to the plate with 2 outs in an inning, 2 outs and runners in scoring position, bases loaded, or all of the above, seriously concern me because those have all been his major problem areas this year. in his first game back from the All Star break on July 17, Michael went 2-for-3 against the Cincinnati Reds. first he drew a 2-out walk in the top of the 1st inning against Mike Leake. then he hit a double off Leake in the top of the 6th and another double off J.J. Hoover in the top of the 8th. not a bad way to start the second half and i firmly believe it was a direct consequence of the time off. in the July 18 game against the Reds, Michael only went 1-for-5, but that one hit was a big one. in the top of the 1st inning, with Kipnis at 2nd base and Lindor at 1st, Michael hit a line drive to deep right field off Anthony DeSclafani on an 0-1 count for his first 3-run home run of the season! breaking down the at bat: the first pitch Michael took was a 91 mph fastball on the outside corner at the knees (which may have been a ball). the second pitch, which he hammered to right, was a 92 mph fastball. and it was the first time Michael had faced DeSclafani this year because when he last pitched against the Tribe (on May 23), Michael received the day off. aside from this being Michael's first 3-run homer in 2015, it was also his first 3 RBI game of the year. it was his first go-ahead hit and go-ahead RBI since June 29 as well. the Cincy series wrapped up on July 19, and Michael had another productive game with a single, 2 RBI, and 3 walks. he came to bat THREE consecutive times with the bases loaded--something that most likely will never happen again. so, since he only totaled 2 RBI, he must not have done very good, right? yes and no. the situation first occurred in the top of the 2nd inning with 2 outs and the Indians leading, 1-0. the ducks on the pond were Carlos Carrasco at 3rd base, Kipnis at 2nd, and Lindor at 1st. i just knew Michael would end the inning because he hasn't been very good with RISP and 2 outs this season. by this time, it had gotten to the point where i just never wanted to see Michael at bat with bases loaded, RISP and 2 outs, or 2 outs in an inning ever again. proving my point, after a 2-1 count against Johnny Cueto, Michael grounded out to 3rd base. the second time Michael came to the plate with bases loaded was with 2 outs (again) in the top of the 4th inning and the game tied at 1. the Indians had Bourn at 3rd, Roberto Perez at 2nd, and Kipnis at 1st base. Michael ran the count full before taking ball 4 from Cueto and drawing himself a go-ahead RBI walk. the third time Michael went to bat with the bases full was in the top of the 6th inning and 1 out. Perez was on 3rd base, Carrasco was on 2nd, and Kipnis was on 1st. lefty reliever Manny Parra had just come on to face Michael, and after a full count, Michael again took ball 4 for his 2nd RBI walk of the game, extending the Tribe's lead to 3-1.
and fyi, that single he hit came in the top of the 1st inning, and his 3rd walk of the game came in the top of the 10th. yes, the game went to extras, but the Tribe prevailed, winning by a score of 5-3. Michael finished his first series post-All Star break going 4-for-11, which is more than acceptable for interleague play. Michael indisputably had his best game of the month on July 22 against the Milwaukee Brewers when he went 4-for-5 with a double, home run, and 4 RBI. truthfully, he could have gone a perfect 5-for-5 if not for some stellar defense by the Brewers. i'm going to discuss all of his at bats right now. in the top of the 1st inning with 1 out and the Indians already up 1-0 thanks to a solo home run by Lindor, Michael logged his only out of the game. Kyle Lohse was behind in the count, 2-0, but then Michael grounded out to 1st base. he smacked it behind the bag and Adam Lind made a diving stop and flipped it to Lohse to rob Michael of a base hit. see it for yourself here. in Michael's 3rd at bat of the game, he hit a go-ahead RBI single to left field in the top of the 5th inning on a 1-1 count off Lohse. Kipnis, who was at 2nd, scored easily. Lindor was at 1st base and was able to advance to 3rd when the ball got away from Brewers left fielder Khris Davis. that also allowed Michael to move up to 2nd. regardless, the hit gave Michael 4 RBI for the day, a single game high for him this season. when Michael's next turn at the plate came in the top of the 7th inning, there was 1 out, nobody on, and he was now facing Michael Blazek. he got his 3rd hit of the game on the 8th pitch of a 3-2 count. he turned on the inside pitch and hit a double to deep right field. he would later score on a single by Yan Gomes. Michael's final hit occurred in the top of the 9th inning. left-hander Neal Cotts was pitching for Milwaukee and on a 2-2 count, Michael hit a 1-out ground ball single to left field for his 4th hit of the game. it was his first hit against a lefty since July 10, because in his 4 plate appearances prior to this, Michael had drawn 4 walks. he was not thrilled with the strike call on the 4th pitch of this AB because that fastball was outside. good thing he was able to hit the next pitch--a slider--into the hole for a base hit. so i think it goes without saying that Michael merited himself a lot of postgame attention. when asked by the media if the swing on his 3-run home run felt as smooth and effortless as it looked, Michael bluntly replied, "i wish. it's one day at a time, one at bat at a time. i hope i can build on this and keep this good feeling that i have going." when Michael comes to bat with runners in scoring position, he's thinking "get the runners in. point blank and simple. do whatever i can to get the runners in. the more runs we score, the better chance we're going to have to win. it's no secret." to be successful in those situations, he says the key is "just trying to have a good approach and staying on my approach. there's no secret. get a good pitch, put a good swing on it, and after that you can't control anything. try not to do too much and stay within yourself." more from that interview can be found here. Michael enjoyed his time off during the break, but he was happy to get back to playing ball again. "coming back, i was excited to be back here with my teammates and getting the 2nd half started. we've got a lot of work to do in the 2nd half. we've got 2 big series at home against our division." "the more chances you get, the better opportunities we're going to have obviously," he added. "it's a learning process every day that we go out there. hopefully we build off of it." Indians skipper Francona had nothing but praise for Michael after the game's conclusion. "he's back to doing what he does. he can hit the ball out of the ballpark. he can hit the ball to left field. when he had the base hit in the 5th and Kipnis scored and Francisco Lindor went to 3rd on the bobble, he showed a burst going to 2nd base. that was nice to see." "he's a really good hitter," persisted Tito on why Michael is successful. "and he doesn't need to do more because he's such a good hitter. but he realizes that. he's smart and he knows for the most part how guys are going to attack him. he doesn't take a ball that's outside and pull it, or something offspeed and roll over. he stays on balls and he just stays through the ball--probably more so when runners are in scoring position, which is good. he's not very susceptible to something slow, even in a fastball count." for more postgame with Michael, be sure to watch his interviews with Andre Knott where he talks about coming back and facing the team that drafted him here, and what he was looking for before he hit that 3-run bomb, along with Knott's "joke" about hitting for the cycle here. so how did Michael follow up his tremendous 4-hit game? by going 0-for-3 versus the Chicago White Sox's Jeff Samardzija on July 23 of course. he did draw a walk off former Indian Zach Putnam in the bottom of the 9th though. i think you just have to chalk that up to superior pitching from Samardzija and nothing more. (meaning, i don't think his back started barking again so soon after the break lol). on July 24, Michael had a 2-hit game versus the White Sox, which i didn't see coming. Jose Quintana pitched for Chicago and Michael started the night with a 2-out double to right field in the bottom of the 1st inning after a 2-1 count. being his first 2-out hit since July 10, it was unexpected. he had gone 0-for-7 in his preceding 8 plate appearances. in advance of the next game versus the White Sox on July 25, the Indians unveiled a Larry Doby statue in their Right Field District. the players and Doby's family all came out to celebrate the event. after the unveiling, Michael had this to say about it: "it's awesome. just having his statue out there, getting the recognition he deserves. #14 is my favorite number. i tried to get it when i got here but rightfully so it's retired for a Cleveland Indian and he deserves utmost respect. it's a honor and a privilege to actually be here for the unveiling of the statue." later that day, for the 2nd time this year, Michael was once again in the lineup when the Tribe had to face the White Sox's Chris Sale. full-well knowing that his career numbers are terrible against this southpaw, i was not excited with Francona's decision to let Michael play in this game. so i was really impressed and somewhat relieved when Michael hit a 2-out double to right field on the 6th pitch of a 1-2 count in the bottom of the 1st inning. Sale threw him a 96 mph fastball and Michael shot it down the right field line. with 1 out in the bottom of the 4th inning, however, Michael struck out looking on a 1-2 count. this is yet another one of those baloney strikeouts because Michael actually should have been ahead in the count, 2-1, except home plate umpire Mike Muchlinski called a breaking pitch outside as a strike. the 4th pitch from Sale was another breaking pitch, and Michael took it to complete the strikeout. all-in-all, Michael went 1-for-3 against Sale. i'll take that over an 0-fer any day. on July 26, something very rare occurred: Michael struck out twice in the game versus the White Sox. first it happened in the bottom of the 1st inning with 2 outs. Michael got to a full count against Carlos Rondon before swinging and missing to end the inning. then in his next at bat with no outs in the bottom of the 4th inning, Michael was down in the count, 0-2, before swinging and missing once again for strike 3. he left Lindor stranded at 1st base this time. Michael finally picked up his first stolen base of the month in the game on July 28 versus the Royals. it was the bottom of the 1st inning and Michael had just gotten on 1st base after hitting a 2-out single to center field off Chris Young. Carlos Santana was batting, and on a 1-0 count, Michael safely stole 2nd base as Young threw ball 2. it was the first time Michael had even attempted to steal a base since June 29, going 23 games from June 30 - July 27 with no stolen base attempts. a lot of players won't risk stealing with KC's Salvador Perez behind the plate, but with Young on the mound and his slow delivery, it was a good night to take the chance. after Santana drew a walk to get on base, it was Brandon Moss' turn to bat. as the first pitch was thrown to him (a strike), Michael and Santana pulled off a double steal with Michael stealing 3rd base successfully for the first time this season. besides that, it was the first time this year that Michael had stolen 2nd and 3rd base back-to-back in 1 inning. this game was also Michael's 2nd 2-stolen base game of the year, his last one transpiring back on May 2. and with those 2 steals, Michael moved into a tie for 1st with Kipnis for the team lead in stolen bases (11 total). Michael got hit by his first pitch in 2015 on July 29 in the game versus the Royals. the Tribe was up 2-0 with 1 out in the bottom of the 5th inning, and the count was at 0-1 before Jeremy Guthrie threw at the back of Michael's leg. i was thinking how getting hit was the last thing he needed because he's still dealing with his back, but after walking it off, Michael looked to be okay. Michael got his payback in his next at bat by hitting a home run to deep right field. it was the bottom of the 6th inning and Lindor had just hit a 1-out, 3-run bomb to give the Indians a 7-0 lead. on the 7th pitch of a 2-2 count, Michael teed off and hit that ball 389 feet. and i love that he posed after he hit it to watch it go, something he doesn't normally do but deservedly so considering the crap Guthrie pulled earlier in the game. in the bottom of the 8th inning, Michael hit a leadoff single to left field off Luke Hochevar on an 0-1 count, giving him a multi-hit game. in addition, he would come around to score later on a Moss single, giving him 2 total runs for the game. oddly enough, the last time Michael scored a run in a game was one week prior on July 22, which was also the last time he hit a home run and drove himself in for a run. he actually scored 2 runs in that game, too, being driven in once by a teammate for his 2nd run of the night. furthermore, Tito delegated the DH spot to Michael for this game. in doing so, that represented Michael's 9th game as a DH in 2015, a new career high. previously, Michael had never been a designated hitter in more than 8 games in one year. that record took place under Francona's jurisdiction as well, in 2014.
on July 19, Michael accomplished something that hadn't been done by a Cleveland Indians player in over 12 years when he drew 2 bases-loaded walks in the game against the Cincinnati Reds. the first RBI walk came with 2 outs in the top of the 4th inning and the game tied at 1. Michael Bourn was at 3rd, Roberto Perez at 2nd, and Jason Kipnis at 1st base. Michael was facing right-hander Johnny Cueto and ran the count full before ball 4 was thrown to him. his second RBI walk occurred in Michael's very next plate appearance. with 1 out in the top of the 6th inning and the Indians still ahead, 2-1, left-handed reliever Manny Parra came in to face Michael. this time Perez was on 3rd base, Carlos Carrasco was at 2nd, and Kipnis was at 1st when Michael got the count to 3-2 and then drew his second (bases-loaded) walk of the game. per Paul Hoynes, via Elias (Sports Bureau), Michael was the first Indian to draw 2 bases-loaded walks in one game since Matt Lawton did it on June 22, 2003 versus the Pittsburgh Pirates. Michael also achieved a feat in July that hasn't been done in franchise history in almost 15 years, according to Jordan Bastian. he was the first Tribe player to have at least 18 RBI and 14 walks with no more than 8 strikeouts in one month since Kenny Lofton put up those stats in August 2000. that's pretty good company. no change here regarding Michael's position in the outfield. he played in left field against right-handed starters and center field against left-handed starters in July. but on July 29, Columbus Clippers outfielder Tyler Holt was called up to the Tribe and played in left field while Michael was the designated hitter against a righty. Holt bats right-handed, so i think there's a decent chance that he could take over the duties in center field against lefty starters, and therefore Michael may not see much of any time in center for the rest of the season. we shall see. Michael got back to his errorless ways this month and played perfect defense in both left and center, giving him a 1.000 fielding percentage for July. that is what we're used to seeing from him. he also had a total of 38 putouts. like in June, there were some games when he did not catch one ball for an out. as a matter of fact, in 3 of the 4 games he played between July 23-26, he had 0 putouts. he again played in back-to-back complete 9 inning games on July 25 and 26 versus the Chicago White Sox (in center field, no less) without recording one putout. he went 26.0 innings, a longer stretch than last month, from the top of the 1st inning on July 25 to the top of the 7th inning on July 27 without a putout. Michael had no outfield assists in July, which is irregular for him. he really only tried to throw out 1 runner this month. that cannot be blamed on his back strain however, because Michael has said that his throws mainly come from his legs. i can only presume the opportunities just haven't been there for him lately. but getting back to his 1 attempt, it took place on July 27 in the game versus the Kansas City Royals in the top of the 5th inning. Alcides Escobar led it off against Cody Anderson. he hit the first pitch towards 3rd base and Giovanny Urshela dove for it, but the ball went under his glove and into left field. Michael got over to it quickly and threw it in to 2nd baseman Jason Kipnis. 2nd base umpire Tom Woodring initially said that Escobar was out; Escobar disagreed. the Royals challenged the call and it was overturned because Escobar got his foot in on the bag just ahead of Kip's tag. it was the 3rd time an assist of Michael's had been challenged this year, and sadly the 1st one that was "taken away" from him. while Michael did not rack up any assists this month, he did make a few extraordinary catches. the first catch i'm gonna highlight came on July 8 in the game versus the Houston Astros. it was the top of the 4th inning and the Astros led, 2-1. Colby Rasmus was facing Trevor Bauer and after an 0-1 count, he popped it up to shallow left field. positioned in a shift, Urshela and Francisco Lindor both ran out towards left from the infield, while Michael ran in from the outfield. Michael got under it perfectly and dove to make the catch. that ball easily could have dropped between all 3 of them, but Michael had the best shot at it coming from left field and hustled to make sure he was there to catch it in time. another spectacular diving catch occurred in the game against the Cincinnati Reds on July 18. Marlon Byrd was batting in the bottom of the 2nd inning with the Tribe up, 3-1. on a 1-0 count from Corey Kluber, Byrd hit a liner to left field, which Michael laid out in "full extension" to catch for the 1st out. it thoroughly convinced me that his back was feeling really strong again as a result of the 4 games he'd just had off during the All Star break, cause you don't make catches like that (without repercussions) if your back is jacked. so that was great to see. here's hoping Michael can do more of that as the season comes to a close, and maybe he can add another assist or two to his defensive stats as well. now let's break down the numbers. i am going to document his July #s, the 3rd spot #s, and the DH #s, as well as the left field #s, the center field #s, and overall outfield #s.
Michael played in 26 (of 26) complete games in July. he started and played left in 15 games, completing 13 of those games, appearing in 16 total. he started and played center in 9 games, completing 8 of those games, appearing in 11 total. he was part of a defensive switch in 3 games, moving from center to left in 1 game and moving from left to center in 2 games. he started and was the DH for 2 games. July 13-16: All Star Break. so far in 2015, Michael has a total of 408 plate appearances and 357 at bats in 93 games (734.0 innings). in total, he has 107 hits, 38 extra base hits, 69 singles, 30 doubles, 8 home runs, 56 RBI, 4 sac flies, 41 runs, 46 walks, 5 intentional walks, 1 hit by pitch, 11 stolen bases (10 - 2nd, 1 - 3rd), 1 caught stealing (3rd), 9 GIDP, 30 strikeouts (19 swinging, 11 looking), 28 first at bat hits, 161 total bases, 149 left on base, 145 putouts, 7 assists, 1 error, and 1 double play. if you're interested in more info about Michael's 2015 #s through July, please refer to my Brantley's 2015 #s Through July blog. and to get all your up-to-the-minute Michael news, follow me on twitter @clevelandgirl23!